According to research conducted by the American Cancer society, more than 30,000 cases of oral cancer are diagnosed each year. Oral cancer is 90% curable when found in its early stages. Unfortunately, a majority of oral cancers are diagnosed too late because symptoms of early oral cancer are rarely visible to the naked eye. At New Image Cosmetic & Family Dentistry your safety and health are our first priorities. 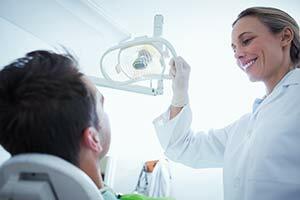 Our dentists and staff are highly trained to conduct thorough and effective oral cancer screenings. We offer our patients the most advanced oral lesion identification system available: Velscope. The unique light enables us to view cancerous and pre-cancerous tissues through the gum tissue before they are visible to the naked-eye. 25% of oral cancer victims have no lifestyle risk factors. This is why every patient needs an oral cancer exam! Oral HPV has the ability to infect your throat and mouth. Once infected, HPV will either go dormant or disappear entirely from your body. HPV has the ability to lay dormant for many years and then suddenly cause cancer. When you have a VELScope® oral cancer screening done, lesions can be found that are in early stages of growth. By catching oral cancer early, a patient’s five year survival rate is dramatically increased–80-90% greater! The oral cancer examination is a completely painless process. During the visual part of the examination, the dentist will look for abnormality and feel the face, glands and neck for unusual bumps. If abnormalities, lesions, leukoplakia or lumps are apparent, the dentist will perform a biopsy of the area. The biopsy includes a clinical evaluation which will identify the precise stage and grade of the oral lesion. During bi-annual check-ups, the dentist and hygienist will thoroughly look for changes and lesions in the mouth, but a dedicated comprehensive oral cancer screening should be performed at least once each year. At New Image Cosmetic and Family Dentistry, Dr. Perkins performs a complete oral cancer screening during the comprehensive exam and also evaluates each year at the re-care exam during your cleaning. If you notice any slow-healing sores or strangely colored tissue, please notify the dentist as soon as possible. If you have any questions or concerns about oral cancer, don’t hesitate to call us at (360) 604-7151.